Purchase a Boston Market gift card at a discount and save money on the comfort food you love! With a menu of rotisserie chicken, ribs, meatloaf, turkey, family meals, sides, soup, salads, and desserts, you can’t go wrong! Scrumptious food for less money- that’s a winning combination! In 1985, Arthur Cores and Steve Kolow opened the first location, and by 2015, there are more than 450 locations across the United States. A discounted Boston Market gift card can be used at any location, saving you money every day on great wholesome home-style food that’s sure to please anyone! Not only can you use your Boston Market gift card for great food any day of the week, but you can also use it for catering! Order online for either carry out or catering and save money when you use your card to pay. What’s more, they even deliver! Why not serve home-style food for your next special occasion and save money too! Their rotisserie chicken is fresh, never frozen, hormone free and flavored perfectly! With chicken roasted fresh every hour, you’re sure to be pleased! You’ll have more money in the bank too! When you purchase a Boston Market gift card from Cards2Cash, you’ll get more of the home-style food you love for less money! We also offer gift cards for many other restaurants, websites, and retail stores! For significant savings every day of the week, make sure to check out our listings for Chick-fil-A, Arby’s, Wendy’s and more! With Cards2Cash, saving money while eating the food you love is easy! Have a Boston Market Gift Card You Don’t Want? Cards2Cash Will Buy It! 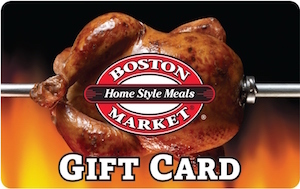 Do you have a Boston Market gift card you aren’t going to use? Cards2Cash will yurn it into money in your pocket! We buy gift cards for many national retailers, and we pay the highest possible price! If interested, visit one of our retail locations, for fast payment for your unwanted card, OR just fill out our online form, and we’ll get back to you with an offer you won’t want to refuse. Whether you buy or sell a gift card, Cards2Cash has you covered!